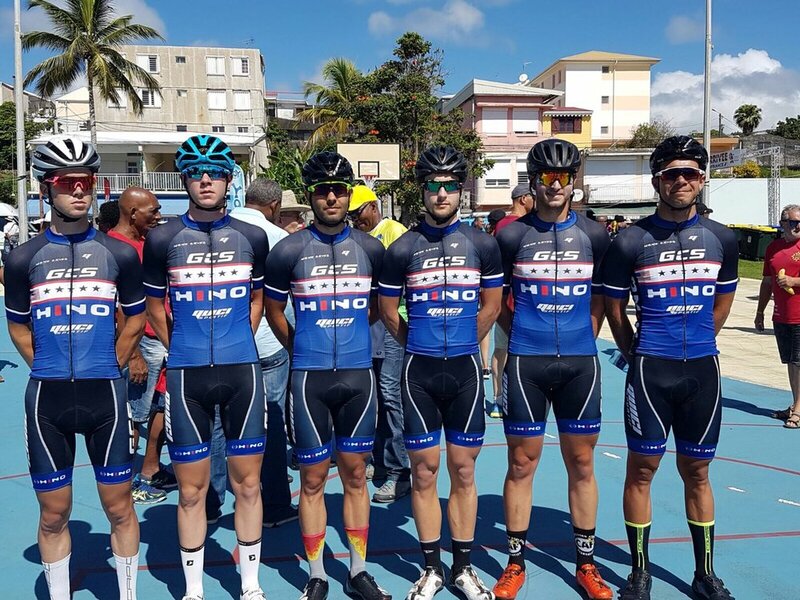 La Grange Cat 2 racer (and this year's winner of the LG Cup Stage 2 PCH Time Trial) Eric Bryan is in Martinique for the Tour Cycliste International de la Martinique. Eric is racing on a composite team that was put together for the race (so don't be alarmed when you don't see "La Grange" on the results sheets), and will be providing reports after each of the 9 stages in the race. Here is his first report, covering Stages 1-3. Eric (far left) lined up with his teammates ready to race! Here goes. 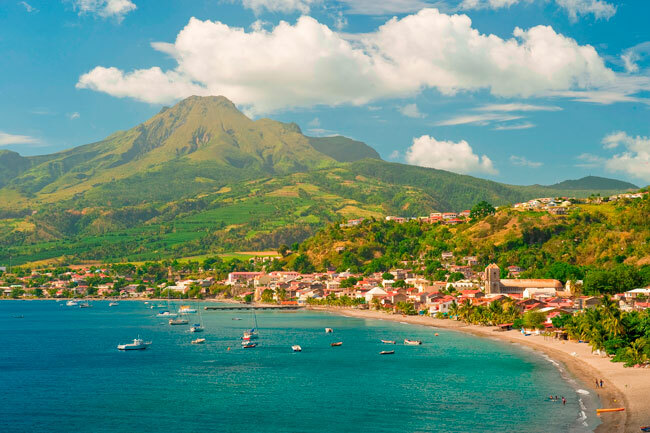 Entering my first international race, I’m out on Martinique, a French Caribbean island, where the weather is hot and humid, the scenery is beautiful, I can’t understand a word anyone is saying, and I’m ready for 9 days of the hardest racing I’ve probably ever done. I arrived 2 days before the first stage to a bike bag full of an exploded can of chocolate rebuild, so now my bike will smell faintly of chocolate all race. There’s not much flat ground on the island, so stage one being on the ‘flatter’ end of the spectrum only involved 1300m of climbing over the 127km (yes, I will be using the metric system for my reports). Each day begins with a nice breakfast at the hotel, and then a bus transfer to the start city, about an hour away for stage one. The weather at the start line is hot, and I arrive to two flat tires (great start!). Once I’m fixed up we have a mini team presentation in the searing sun (my Garmin reads 110F (ok, I’m not 100% metric)). The neutral start is some wacky business, we roll out to the street, stop, and then start again and the race is on. Within 2 minutes I’m already avoiding crashes left and right; the road is crowded as people fight for position before the first climb of the day, a quick cat 3 only 8km into the race. Once the break went around km 15, the race calmed down and it was just a hot suffer fest until the end. The day was an endless cycle of slight ups and downs and bottle after bottle of water (8 bottles in 3 hours). Once we reached about 10km to go, the race got hectic again. The race blew up on the final cat 3 climb, the backside of the one at the start. Spent, I couldn’t follow the main acceleration, and I ended up dodging stragglers and caravan vehicles as I made my way down the treacherous descent. I almost went off the road twice, and at the bottom I joined up with another rider to chase down the main pack about 45s up the road. Unfortunately, we separated around some road furniture and I ended up on my own. I looked back, and now I was in no-man’s land alone chasing a group of 20 and being chased by a group of 10. 3k to go. The heat was killing me but I knew that if I was caught by the group behind me I’d be promptly shot out the back, so I hunkered down and put my all into it. Suddenly I was dodging caravan cars again as they backed up near the finish line. 1k to go. I didn’t look back, and I stood up to carry it to the line. About 10m to go I was passed by one rider, but only one. I made it, and I wanted to pass out from the heat. I weaved my way back to the team car and chugged a bottle of ice water. After the day, I’m 34th overall, 2 min behind the leader, and 9th in the U23 competition, 1 min behind the leader. Team USA has Phil in 25th, about a minute ahead of me, and 4 more guys still in the race with a long way to go. Not every day can be my day. Ah but how I wish I could blame this day on something about my fitness, fatigue, or even luck. No, instead I tossed myself a tough day due to a mental slip. Stage 2 began in the same spot as the start and finish of stage 1, and the profile was nearly identical to the previous day. However, I wasn’t as attentive to my positioning at the beginning, and the two early climbs found me near the rear of the peloton. On the second small descent, a group of eight riders at the back were gapped off by a poor descender, and that 10 second gap doomed us. Over the course of the next 20 minutes, my groupetto chased hard (well some of us did), but those 10 seconds went to 30, then a minute, then a minute and a half as the peloton surged with attacks at the front of the race establishing the day’s breakaway. Soon enough, the four motivated riders were gassed and the day became a grueling day of slowly rolling to the finish town. If you’ve ever ridden in a groupetto in a stage race, you know it can be frustrating. This group was made more so as riders seemed to want to hammer every climb and soft pedal the flat sections. I made my way by dropping back on the climbs and easily riding back on after the idiots gassed themselves for the hundredth time. 3 long hours of riding later, and we finally rolled disappointingly into Fort-de-France, 36 minutes behind the leader. 36 minutes. From a 10 second gap. My mental error just ruined all hope I had of displaying some consistency in the race. Now I know I can possibly salvage the race with a good stage result, and 9 days is a long time and I’ll likely crack hard later in the race which will also trash my GC standing, but in the moment, I was pissed. To add to the misery, I now had to wait 3 hot hours to start a short TT, which I planned on riding easy since to lose another minute at this point meant absolutely nothing. Attempting to recover in 90 degree heat and high humidity is a lost cause, so I wasn’t feeling fresh when I lined up for the TT. Nothing too interesting to report on the second part of the day, as I stuck it at a clean 90% and rolled in a solid 13 min interval. It was nice to have a huge cheering crowd (thankfully French colonized over their passion for cycling to the Caribbean), but I was still lost in my frustration at the results of the morning. It would take until the next day to recoup some positivity. Eric at the time trial start ramp. One final flat day to mark the first third of the tour. 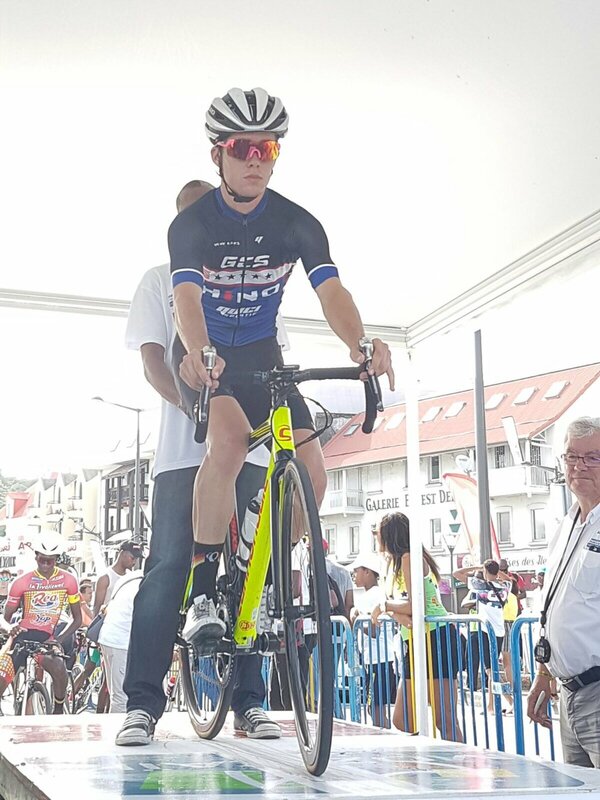 We repeated the same loop as in stage 2, except starting from Fort-de-France and ending in Trinite, so I focused clearly on getting to the front early and never letting myself be caught out. This ended up a little too well for me in the beginning, as I found myself chasing the day’s breakaway solo (whoops). I knew I could cross the gap to the 3 riders up the road, but I thought I might have some help. No such luck. I made it to the back of the break right as they turned up a 2 minute climb, but I was gassed and lost the wheel over the crest. I joined up with 2 more riders to chase the 3 riders up the road, but we didn’t work well together (Caribbean riders seem to have an affinity for hammering climbs and chilling on flats, which makes for a crappy chase). As we lost some time to the break and didn’t gain much on the peloton, I decided to cut my losses and save myself for the huge day coming up in stage 4. I joined back in the peloton and rode the rest of the race uneventfully to the finish, only just missing the final selection over the final category 2 climb to finish 39th. While the decent result made me feel better, it was a bit bittersweet as I knew I could have had a good shot at the U23 top 5 had I not screwed myself yesterday. But the race rolls on for 6 more stages (and in all likelihood, I’ll crack hard at some point from fatigue, which will negate any regrets I have about stage 2), and tomorrow is a big day with what looks to be at least 3000m of climbing in a mere 100km race. It’s likely my best shot for a good result this whole tour, so come back soon for an update!